There’s a steakhouse we go to every few months, and they have this strange policy — they don’t uncap your chosen bottle of wine at the table in front of you. Instead, they uncap it at the bar and bring you the opened bottle with no cap on the side. How their system works: I choose the wine I want either from the minimal wine list or from a locked display cabinet and let the server know which one. Out of sight of the customer, the server unlocks the cabinet and gets the wine, or gets it from the bottleshop that is attached to the venue, or gets it from somewhere else. The server then opens the wine behind the bar and brings the opened bottle to the table with the wine glasses. How do I know that no-one has ‘doctored’ the wine with a foreign substance? How do I know that no-one has dropped a sedative drug into the wine? So when we were paying our bill at this restaurant last night, I asked why the wine was not uncapped at the table by the server. No-one could give me a logical, reasonable response. Instead I got ‘it’s policy’, ‘that’s how we do it’, ‘we don’t give you the cap because it might be put back on the bottle and then the bottle used as a weapon’, ‘it’s licensing regulations’ and the like. I particularly liked the ‘used as a weapon’ response — this from a place that serves big juicy steaks and that has HUGE steak knives sitting on every table when you walk in. I’m talking 6″ plus steak knives with a 1″ wide blade and a decent serrated edge and a solid wooden handle. You want to prevent people from using a bottle as a weapon? Then reconsider the placement of massive steak knives at every place setting. And weapons? In a family restaurant in a country town frequented by your typical middle class couples and family groups? Highly unlikely. If they had wines with a cork, would they also uncork the wine at the bar, or uncork it at the table? 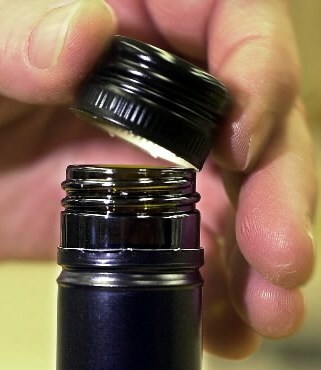 If they would uncork it at the table, then why not use the same procedure for Stelvin caps? All their excuses are very lame. And I doubt licensing regulations have anything to do with this ‘policy’. I’m still concerned that they won’t uncap a wine at the table in front of the customer who has paid for that wine. And how do you know if it’s even the bottle you chose? Well the bottle still has the label on it but what you don’t know it’s if it’s straight from the cabinet of from under the counter. They would have lost my business!!!!!! There’s no justifiable reason for such activity!!!!!! You are right to be concerned. I wouldn’t accept it either. If there is nothing fishy, why hide the activity?